Hundreds of Hesder yeshiva students enlist to IDF this week, amid talk of changing and lengthening army service in the five-year program. A new group of recruits was inducted into the IDF at Tel Hashomer base this week, among them hundreds of Hesder students. 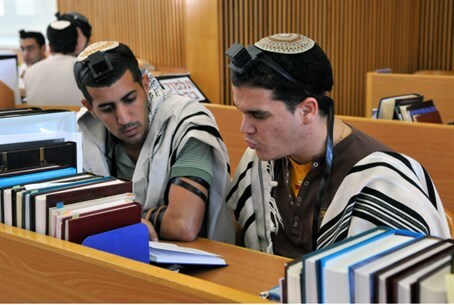 Under the five-year Hesder program, students balance their army duty with yeshiva studies. While hareidi enlistment has been at the core of a recent push to change the draft law, culminating in the new Enlistment Law passed Wednesday, Hesder yeshivas have been targeted as well. Two weeks ago, Defense Minister Moshe Ya'alon ordered the IDF service of Hesder students lengthened from 16 to 24 months. Arutz Sheva got to speak with some of the new soldiers and their proud parents, asking how the new changes affect them. Yoni Shwartz, a new recruit to the paratroopers unit, enlisted along with 11 fellow Hesder yeshiva students. "I think I have to prove the Hesder, we have to prove our way," noted the young soldier when asked about the talk of changing the program. Chief Rabbis David Lau and Yitzhak Lau were among those supporting the Hesder program, in a visit to the Kotel Yeshiva in mid-February. Speaking to the students, who were soon to begin their army service, Rabbi Lau said "you will be sanctifying the Name of G-d and fulfilling the commandment of defending the Jewish people from its enemies, of which there are unfortunately many." Rabbi Lau added that by being among non-religious soldiers, the Hesder students "will have the merit to facilitate and spread the love of Heaven by others, where people will see your behavior and praise those who study Torah."